Rain severely affected running on the opening day of the first 2019 in-season test. 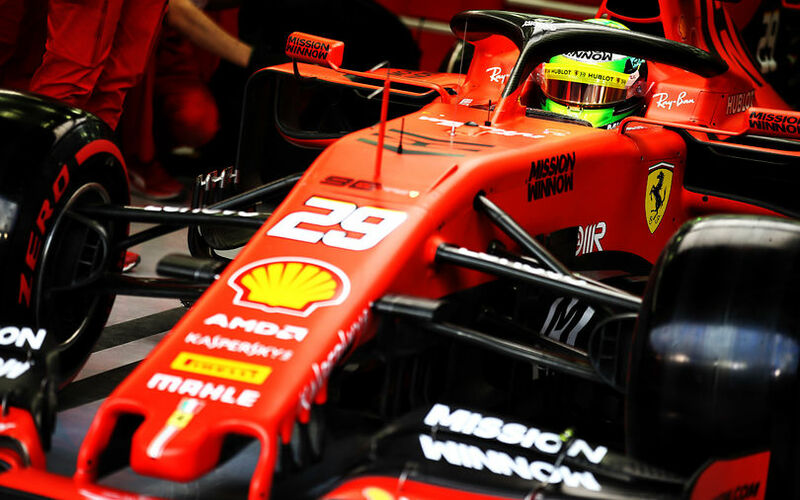 At the end of the day, Max Verstappen topped the timesheets, half a second ahead of Mick Schumacher who made his debut for Ferrari. Weather conditions began overcast and windy but rain showers, late morning and early afternoon, before constant rain, restricted on-track running with over four hours lost due to a damp or wet track in today’s scheduled nine-hour test. Although the rain eased up quite early, the light winds, relatively low temperatures, cloud cover and humidity, meant it took a long time to dry. Teams were able to resume proper running again shortly after 5pm, so the day was split into two quite distinct sections. Most teams were out in the morning with some aero rakes to improve their understanding of their on-track aerodynamics. True performance work wasn't really possible in the morning due to the poor conditions of the track. The rain that was added into the mix was a serious issue for those who struggled in the first two races. Robert Kubica for instance said before the test it would be crucial for Williams in order to understand the different behaviour among the team's two chassis, but his lack of running meant little was learnt. "There is not a lot to say as we were unlucky with the weather", commented the Pole. "We did manage to complete a few runs and gather some data, but unfortunately, we were not able to test anything." Team mate George Russell, who completed the first half of the session for Williams, was more optimistic, noting the team still "managed to conduct a good test and gain valuable data to optimise the FW42". Most other teams and drivers were more optimistic, with Toro Rosso for instance managing some longer runs to end up with 71 laps for Albon, just 6 less than Lewis Hamilton who was the most active driver of the day. Meanwhile, their engine partner, Honda, experimented with engine maps. "This test is useful", said Masamitsu Motohashi, Honda F1's deputy technical director. "We can confirm the lessons we have learned from the two race weekends and it will help us optimise our PU calibration for the coming races. Furthermore, as this is a test, we can experiment with a wider range of PU settings than we would during a race weekend and this helps give us a clearer picture of the PU behaviour." The happiest man of the day was probably Mick Schumacher as he made his debut in an F1 car. "I really enjoyed today", Schumacher said. "It felt like home in the garage from the very first moment with a lot of people that know me since I was very young. The SF90 is incredible because of the power it has, but it is also smooth to drive, and that’s why I enjoyed myself so much. I was impressed by the braking power an F1 car has. It seemed to me you could brake later and later and the car would have made the turn anyway. I would like to say thank you Ferrari for this incredible opportunity and I’m looking forward to test the Alfa Romeo tomorrow." Along with the usual testers, McLaren had a second car in action to conduct tyre testing for Pirelli. The team put Fernando Alonso, hoping to get some comparing remarks versus the team's 2018 car. "The car is a step forward in every aspect from last year. The car has more grip, it’s less draggy on the straights, the engine is a step better, so overall as a package the car is going in the right direction and we’re closer to the front. We saw in the first two races that there is still another step to make if you want to compete with the top three teams, but as a first step I think it’s a good baseline and there’s a good programme of development." Finally, Max Verstappen, who topped the times today, was pleased by the team's progress as Red Bull worked to understand their rear grip issues they endured during the race weekend. Testing continues tomorrow at Bahrain for the second and final day of testing.